Sustainable Sourcing is the integration of social, ethical and environmental performance factors into the process of selecting suppliers. Sustainable sourcing is needed as supply chains continue to expand globally into developing countries seeking lower costs and greater production capacity they expose companies to an ever wider array of risks. These risks include not only include risk of supply disruption, cost volatility and compliance with local laws and regulations, but also in brand reputation: Companies must meet the growing expectations of stakeholders (including customers, shareholders, employees, NGOs, trade associations, labor unions, government observers, etc.) to take responsibility for their supplier’s environmental, social and ethical practices.Thus, companies increasingly making responsible sourcing an integral part of their procurement and supply chain management processes to understand and manage these risks in the supply chain. The ultimate goal of Sustainable Sourcing is to build strong, long-term relationships with suppliers. Improving performance in environmental, social and ethical issues is becoming a major part of the overall process. Working toward this has become an extension of the company’s commitment to corporate responsibility and as such becomes a part of the overall business structure and model. Effective supply chain management can foster and build competitive advantage for companies especially in sectors where production is mainly outsourced such as food and clothing. 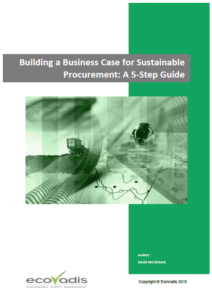 Typically the procurement leadership develops a vision that aligns with company responsible business policy, and then adapts their procurement policies to include responsible business in the various processes and criteria for suppliers selection and management. When a company is engaging a supplier, a company must make it clear these new expectations that the suppliers must meet . This is usually codified in a code of conduct, as well as integrated into contracts, and supplier interaction and communications such as RFX templates.. 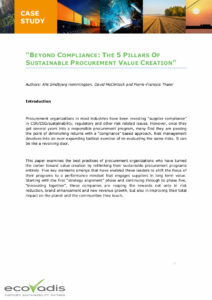 Provide the vision, training and tools for buyers to integrate Sustainable Sourcing into their work and procurement decisions. This may include new software, training in CSR and responsible business, and a complete change management plan. Internal change management programs to convey to the corporate buyers that the impact their buying decisions will have at factory level and promoting cooperation between corporate buyers, supplier sales team and units of production when planning schedules of production. As part of the process, companies should encourage their suppliers to develop responsible practices on their own. Educate suppliers on the business and community benefits of practicing responsible business: This may include productivity, quality, community support and engagement, improved recruiting, employee turnover and renewal of contracts. Work collaboratively along with suppliers in structuring objectives for their responsible business performance. Ongoing monitoring using assessments and audits are essential to maintain their supplier’s environmental and social performance and practices. Using multiple sources of data and input from stakeholders is vital for having a balanced and thorough view of performance over time.Companies may be able to greatly accelerate their program and save costs by seeking out related initiatives in their industry sector, whereby they can partner with other companies within the same sector and develop common approaches to assessing and montioring suppliers. Transparency is the final step to building and maintaining stakeholder trust. The program should produce supplier performance information that can be adapted to include in an annual CSR reporting. Check basic facts about the social and environmental legislation in the countries of production of prospective suppliers. Find out about the level of enforcement in these countries to assess production risks. Check whether prospective suppliers qualify for independent certification of conformity with recognized social and environmental standards. Clearly define your expectations to your suppliers. Make clear that compliance with all applicable laws is a minimum. Explore potential risk areas with suppliers and agree on the desired level of performance. If necessary, use a supplier code of conduct as a benchmark for compliance and incorporate supplier requirements into commercial contracts. Raise awareness among your purchasing officers of the impact that their purchasing practices might have on production at factory level. Carry out assessments of suppliers’ facilities and practices, including through independent monitoring where appropriate, or by organizing onsite visits and worker interviews.